These two stages may not look very different, but there are some subtle changes. About 1/4 up on the left side of the rocks in stage 3, there are three light areas which are mostly vertical. Though they are clearly in the reference photos I have, they are distracting. I felt it important to make them less obvious. In several areas on the rock, I increased the contrast between the light and dark areas. Also, I painted the snow at the bottom between the rock faces. 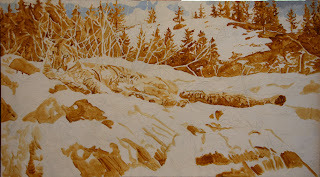 In this 4th stage, I also darkened the valleys in the snow and painted in the dark areas on the right of the painting. 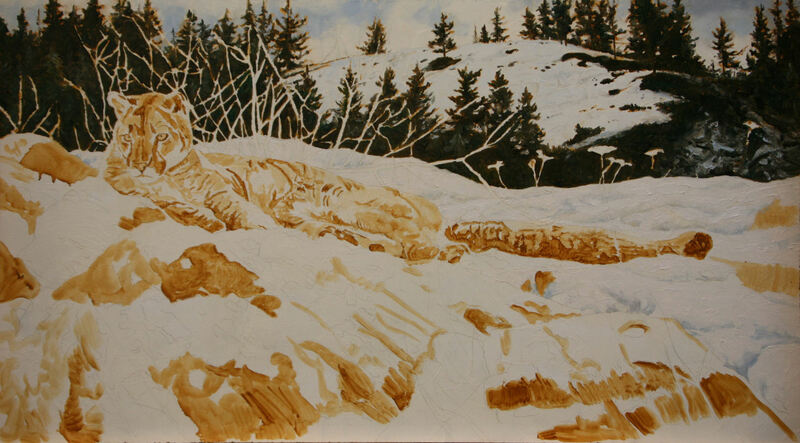 In the next phase, I will begin working on the mountain lion. Working wet on wet (not waiting/allowing the oil paint to dry but blending the edges), I work on my background. 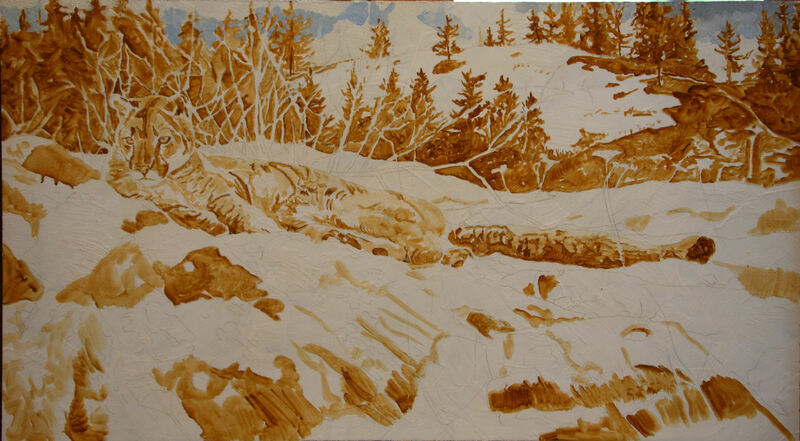 You can see a lot of the raw sienna + burnt sienna underwash peaking through especially at the top of the trees. I am not sure if I will leave all of that showing, but at this stage I am not ready to paint over it. The background has been kept in cool tones. I think this will make the sunlit cat stand out. The very beginning of the near snow has been painted. I may take out the snow just to the right of his neck and let the upper part of his back be against the dark tree background. Another decision I will leave for later. Stage 1 (Turpentine value study) Plus a start on the sky. Some of our current rules: Never cut a painting in half with the horizon line. Put the main focus in one of the corner intersections of thirds, and under no circumstance, lead the viewer's attention out of the painting. Well, I want to challenge that last in a painting. In reviewing the photos I have taken of cougars, there were a lot which were exceptional but which didn't speak to me. Maybe because they didn't say anything new. Except one. It just grabbed me. Perhaps because this big male mountain lion was looking at something out of the field of view and rather than being on the right side of the image and looking to the left side, he was on the left looking to the left. His gaze felt intense. 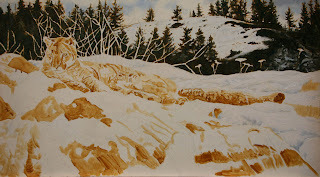 My reference photo had a really dark background of trees behind him with no sky and the snow was high next to his back. What if I made an exit (showed background with sky) weighting the upper right to balance his gaze to the lower left? Then, drop the snow line next to the cat. The next issue was I wanted to address was cropping. A long horizontal painting will create a peaceful scene ......which can be interupted by the cat whose intensity throws everything off balance. That is my initial thinking. Break a rule, keep things off balance, and drama will follow.